My daughter H is building a gingerbread house with a difference. For starters, the biscuit mixture is sans spice, much to the horror perhaps of traditionalists. It turns out, my family simply prefers gingerbread without the ginger. But that is where the simplicity ends. This is much more than a house. It is a castle! 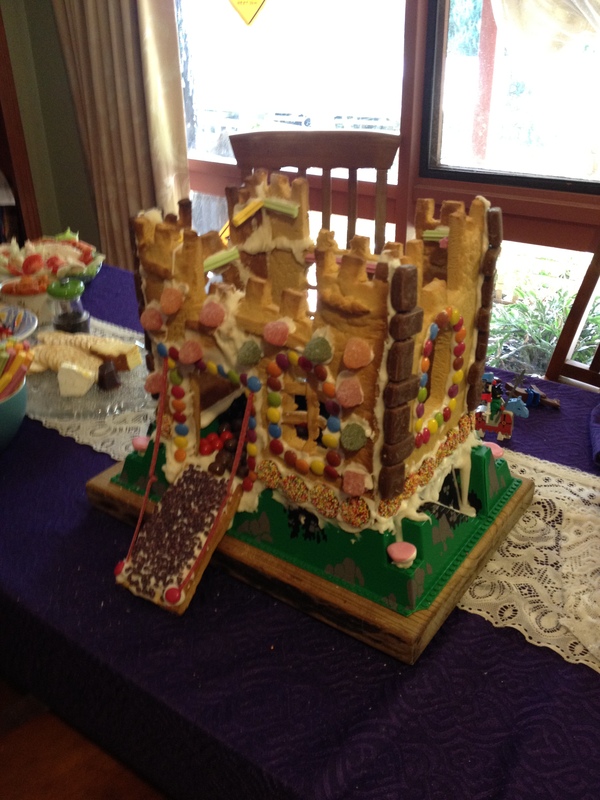 She has built it on a Lego base, with turrets, arched windows and even a drawbridge. H baked the walls yesterday, carefully measuring them to fit the base using a template made from a cocoa pops box. One of the walls was damaged overnight. Not sure how … boys and pets plead innocence. But clearly some form of enemy was abroad, because this morning, a side wall lay in three pieces. H wasn’t fazed. 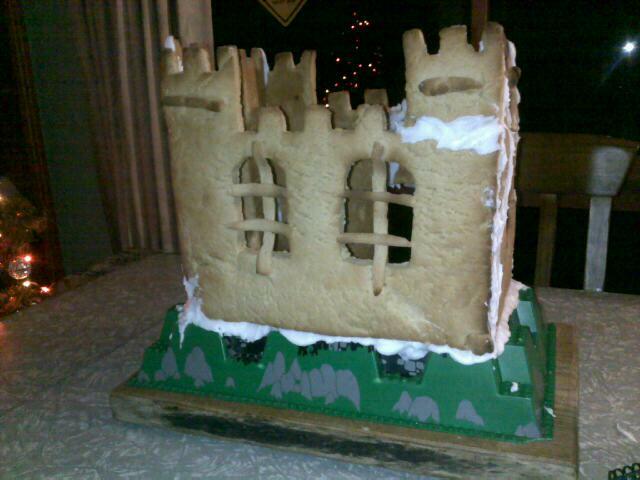 “It’s an authentic ruined castle,” she said, and calmly mortared it back together with icing. And now it’s done! A work of art, I’m sure you’ll all agree. 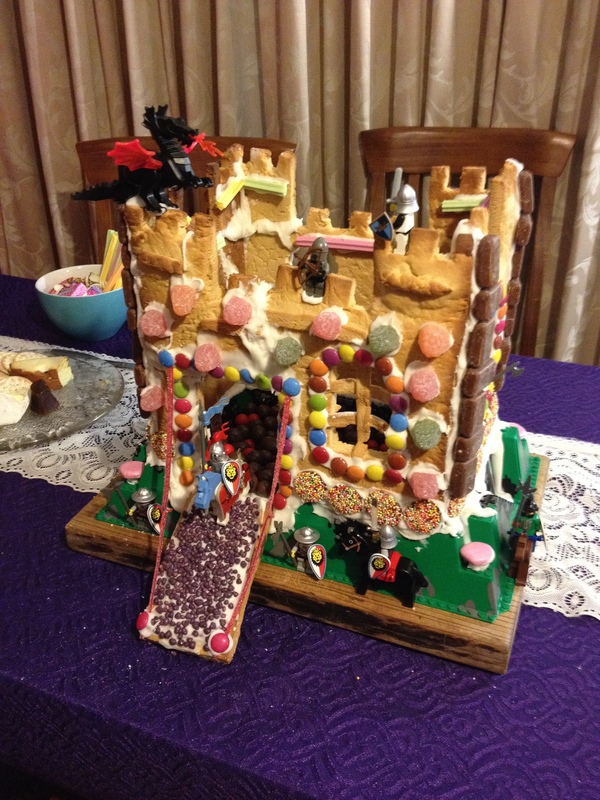 Lego archers, swordsmen and knights on horseback, defend their castle from a fearsome fire-breathing dragon perched on a biscuit battlement. Brilliant H. Absolutely brilliant. And a merry Christmas to all! Out of the ashes of Black Saturday 2009 came an urgent need for fences to be rebuilt. Kilmore East farmers, Kevin and Rhonda Butler, were among those whose fences were burnt. Needing to quickly secure their 1,500 sheep, they sought assistance from family, friends and local volunteers to help rebuild their fences. Within a week, the fences were completed – a task that would have taken them months to do on their own. Grateful for the assistance they received, Rhonda and Kevin decided to try to help a few others with their fencing. Thus, BlazeAid was born. Thanks to them, thousands of long- and short-term BlazeAid volunteers have come to help rebuild fences for the victims of bushfires and floods. My son M spent a month in Charlton earlier this year, doing just that. By lending a hand in true Aussie style, BlazeAid volunteers not only built fences, but helped to restore the spirits of those who’d suffered through a series of Australia’s worst natural disasters. 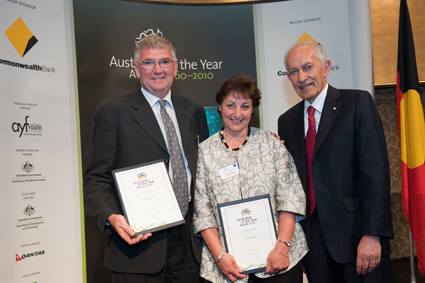 The leadership, courage and self-sacrifice Kevin and Rhonda showed in setting up and coordinating Blaze Aid has earned them a Rotary International Award and Victorian Local Hero Award. Kevin goes on to say ” … the VicRoads compensation package is entirely unsatisfactory and my unbroken family links here go back to 1872. Unfortunately, I cannot run my business and devote myself to the huge undertaking of coordinating BlazeAid, as well as spending hours each day trying to save my home as I try to lobby and negotiate with VicRoads and the State Government. I have also requested to my editor at the Weekly Times, Natalie Ward, to place on hold for 12 months my monthly column “On the Farm” which I receive considerable remuneration for. 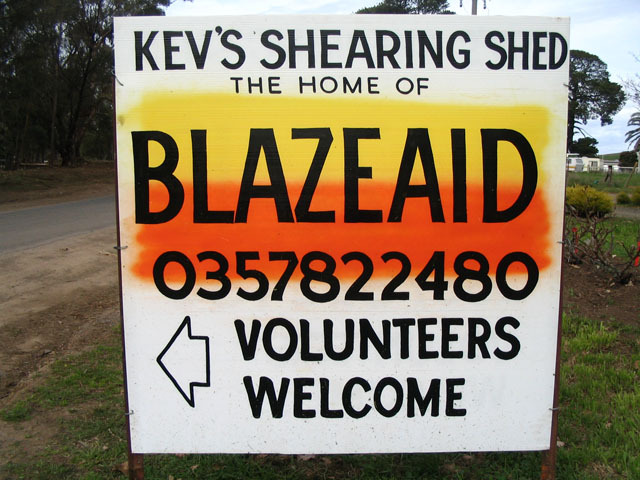 I remain passionate about the work of BlazeAid. After Black Saturday in 2009 and 2011’s Cyclone Yasi (Tully) and Big Australian floods (Bridgewater, Charlton, Tenterfield, Murgon, Stanthorpe, Toowoomba, Warwick, the Gascoyne region), seven thousand Australian and overseas BlazeAid volunteers worked with nine hundred home owners to rebuild their fencing and get back on track with their homes and farms. BlazeAid volunteers contributed a massive 35,000 working days and millions of dollars worth of fencing assistance. Sadly, it is inevitable that Australia will have another natural disaster and a community rebuilding effort will be needed … Meanwhile, my intention is to have the time and energy to fight – alongside my neighbours – the taking of our homes and farms. I regret that – until the threat to my family and neighbours of losing our homes and properties is removed, and I can again concentrate on what I love doing – I must forego my position with BlazeAid. No Kevin. It is us who should apologise to you. I for one, will be emailing Victorian Premier Ted Baillieu on your behalf. I hope many others follow suit. My deepest thanks to you and Rhonda on behalf of all Australians. Varuna – The Writers’ House, is a wonderful asset to Australian authors. 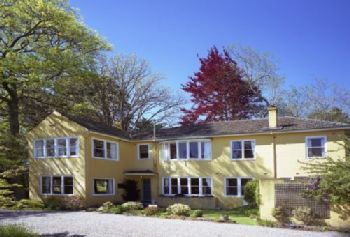 Established in 1991, Varuna is a unique environment in the Blue Mountains, designed especially for writers. 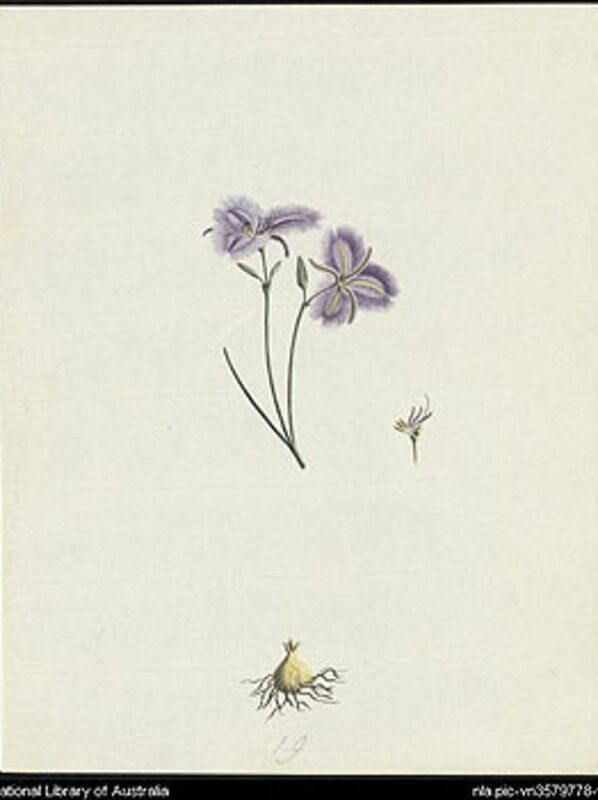 The house itself was a gift to Australian literature in memory of the novelist Eleanor Dark. Eleanor, who died in 1985, published ten novels, including ‘The Timeless Land.” This was a best-seller in Australia and the United States, and was made into a popular television series. Varuna is now recognised, nationally and internationally, as a special place for new, emerging and established writers of all genres. 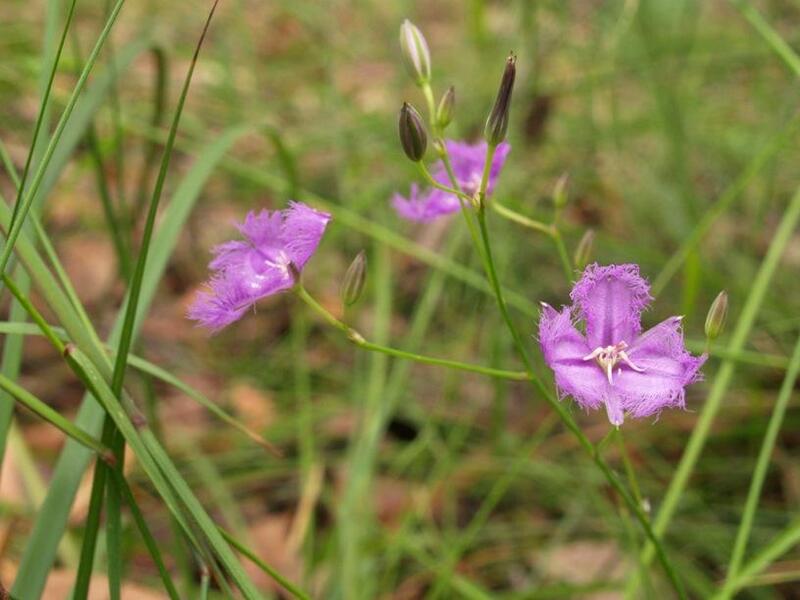 It offers a community of support. It enables writers to develop their work, to find their voice. Varuna works closely with publishers such as Penguin and Harper Collins, and it supports promising work through its pathways to publication programs. I’ve been fortunate enough to enjoy two stints at Varuna – completing a professional development residency with the inimitable Peter Bishop, and as a writer in residence during a regional writers week. At Varuna there is no television or radio. All mobile phones are switched off between the hours of nine and six. During this quiet time writers work privately, except for individual consultations with their mentors and/or editors. Writers are provided with nothing more than a room, work space, dictionary and thesaurus. Catered dinners are accompanied by readings, lively discussions and bottles of wine. Writers have been known to produce up to 50,000 words during a ten day residency. That’s what an environment totally dedicated to writing can do for you. It is quite simply heaven.